In 1997 “Rodgers and Hammerstein’s Cinderella” debuted with Brandy Norwood as the main protagonist, Cinderella. In 2009 “The Princess and the Frog” premiered with Tiana, as the first African-American Disney princess. Royalty, for the African-American community has been a foreign concept whether in film industry or real life, until now. Emma McQuiston will be the first person of African descent to become a Marchioness in Great Britain’s royal line. However, McQuiston is not the first and only woman of African descent to be considered royal. McQuiston, who is a former model, aspiring television and food blogger, will marry into British royalty with her June wedding to Ceawlin Tynn. When she marries, she will first become a Viscountess, until her husband inherits his father’s title. At that time she will become a Marchioness. Essentially, a Marchioness is a British title of nobility under a Duchess, but above a Countess. McQuiston is of mixed ancestry, the daughter of Nigerian oil tycoon, Ladi Jadesimi and Suzanna Louize. According to “Britain’s blue blood has been mixed for Centuries” by Harry De QuetteVille for The Telegraph, McQuiston has faced adversity, “some snobbishness, particularly among the much older generation”. She told Tatler magazine: “There’s class, and then there’s the racial thing,” McQuiston said. Although, McQuiston has faced some hardship she is still making an impact on the community with “Live Below the Line” campaign, a campaign aimed to fight global poverty and hunger. Also, McQuiston expressed a desire in her interview in Tatler to have children immediately after her wedding. She has an active presence on Twitter and updates her own website with recipes and wedding details. Another woman of African descent who is considered royalty is Princess Angela of Liechtenstein, a small German speaking country bordered by Switzerland to west and south and by Austria to the east and north. Princess Angela of Liechtenstein was born Angela Brown in Bocas del Toro, Panama in 1958. She came to New York to work as a fashion designer in the 1990s and met her future husband Maximillian of Liechtenstein, son of Sovereign Prince Hans Adam. 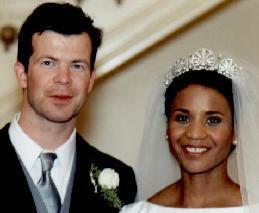 The two married in New York in 2000. The couple has a son Prince Alfons. It is said these two, Princess Angela and her son, are the current highest ranked members of European royalty of African descent. Although, the current highest ranked members of European royalty of African descent, Princess Angela and Prince Alfons may not be the highest ranked members of European royalty of African descent. Queen Charlotte of England, wife of George III, is considered by many to have undoubtedly African features. According to “Stuart Jeffries: Was the consort of George III Britain’s first black Queen” by Stuart Jeffries for The Guardian, Queen Charlotte of Mecklenburg-Stelitz, who descended from partial German descent is also said to descend from a African branch of the Portuguese royal family by way of Magarita de Castro e Souza, a 15th-century Portuguese noblewoman, who descended from Valdez who are said to be Moor and thus of African descent. Queen Charlotte’s African origin has neither been proven nor disproven, and can only be confirmed through DNA testing, which Britain has made no steps to take. Whether or not Queen Charlotte descends from African genes is uncertain. However, what is certain is women of African descent such as Emma McQuiston and Princess Angela are supplanting themselves in traditional Anglo-Saxon European royal dynasties.